L-Acoustics LA8 3-Way Amprack - Hire | On Event Production Co. The L-Acoustics LA8 amplified controller belongs to the generation of high-end integrated controllers entirely dedicated to the comprehensive operation of L-Acoustics loudspeaker systems. The LA8 combines in a 2U lightweight chassis the resources of a 2 x 4 DSP engine driving four channels of amplification delivering up to 1800 watts each with a comprehensive library of factory presets and a user-friendly front panel interface. Featuring network remote control (via LA Network Manager ), up to 253 LA8 amplifiers can be controlled across a network. 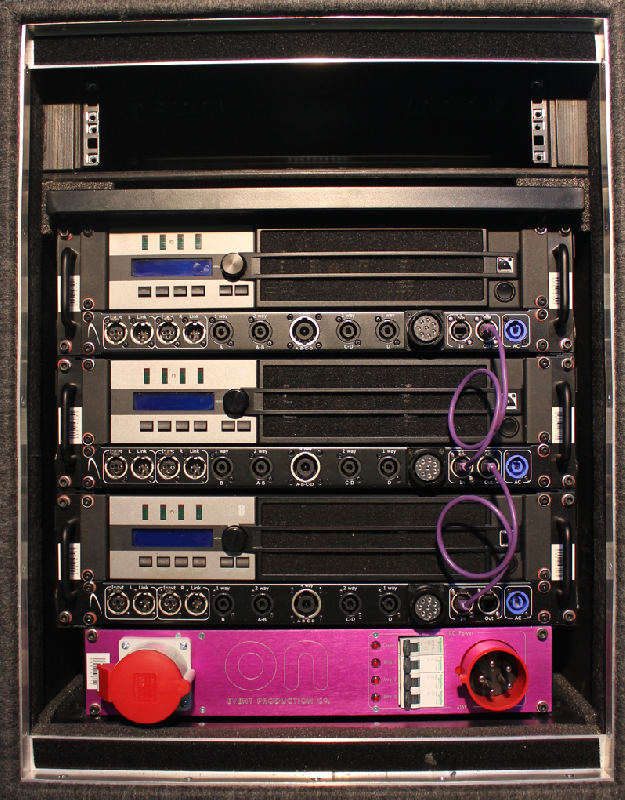 All of our LA8 amplifiers feature a custom designed 1U patch panel which brings all input/output patching to the front panel with a pair of XLR Inputs and links, four NL4 outputs, an NL8 output, a CA-COM output, two I/O Ethernet connection ports for network remote control and a Powercon power input.